Shinola's watches on sale in its Ann Arbor, Michigan store. The company now has more than a dozen US locations and one overseas store in London. US President Barack Obama was in a gift-giving mood last week in London. He presented Queen Elizabeth II with an album of photos of her meetings with former presidents, and he gave British Prime Minister David Cameron a watch from Detroit. The watch was built by the luxury watchmaker Shinola. And President Obama’s gift was a marketer’s dream — the company is actively trying to expand its European sales. Since its founding in 2011, Shinola has grown into a leading US watch manufacturer with $100 million in annual sales, in part by building an attractive product, but also in part by aligning its image with a gritty, re-emerging Detroit. The company has been a bright spot for Detroit, a story of resurrection and a return of new manufacturing to America's manufacturing city. The marketing strategy has worked well in the US. But will the Detroit comeback story sell watches overseas? At the Shinola factory in midtown Detroit, Myra Mosely paints the sides of leather wrist straps. She used to work nearby in the auto plants. Here's what she wants people in Europe to think of when they hear about watches built in Detroit. Next to Mosely, a worker stamps the name “Detroit” onto every strap. “Detroit is awesome. It’s coming back. It’s stronger than ever,” Mosely said. Shinola began with 20 employees four years ago. Today, they have more than 500, most of whom are in Detroit. The watches are built there by people using tweezers to put tiny components in place, more than 100 pieces in some watches. But watches are about more than just style, or telling time. We also care how they make us feel; what they say about us, or about us as gift-givers. 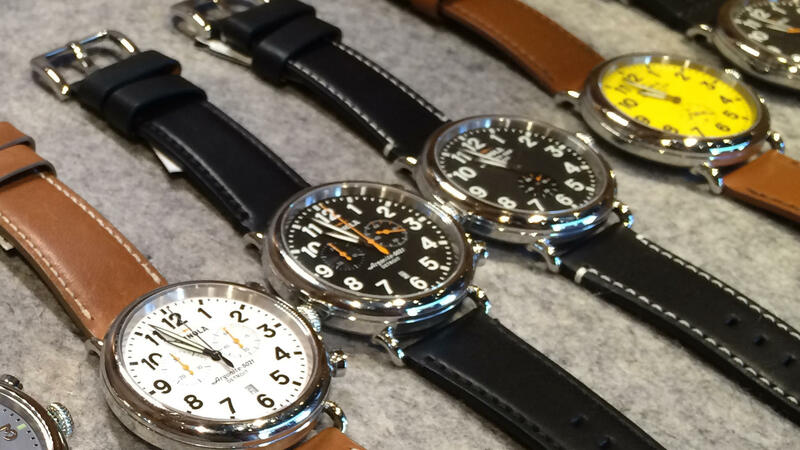 Shinola is selling its watches in key European markets from London to Paris to Berlin. It also recently began moving to smaller markets like Stockholm. I was there recently and on the lookout for people wearing nice watches. “I’m wearing a Regal watch,” said Fredrik Möller, who works for the Swedish government. Most everybody I met in Stockholm was puzzled by what a Detroit-built watch is supposed to say to them. There’s a key distinction to be made here: Shinola deliberately says its watches are “Built in Detroit,” not “Made in Detroit.” The Federal Trade Commission requires that if a company wants to use the “Made in USA” label, or in this case, “Made in Detroit,” the product must be “all or virtually all” made in the US. For Shinola’s watches, the movement components are made in Switzerland and Thailand. The hands and dials are made in China and Taiwan. The nylon strap material is made in Japan. The leather is made in Michigan, Maine, Illinois, and Florida. Shinola argues that it is fair to say “Built in Detroit” because, well, that’s where its watches are assembled, crafted and designed. Critics have said that Shinola could get the raw metal and cut them into tiny parts — gears, springs and screws — if the company really wanted to be genuine in its claim. One Kansas City watch company, Niall Luxury Goods, did get in trouble recently with the FTC for overstating its American-ness. So it added the tagline, “with Swiss movements.” Despite the legal guidance with that case, Shinola is sticking with its “Made in Detroit” slogan. Back in Stockholm, I asked several people what they associate with Detroit. “The car industry, bankruptcy,” said Gunnar Söderholm. “The first thing I think about is actually the Detroit Red Wings, because it’s my favorite NHL team,” said Felix Formark, the CEO of Sjöö Sandström, a high-end Swedish watchmaker. But, does he think Shinola watches, and the Detroit label, will sell in his country? Formak knows first-hand: It’s tough to compete with the Swiss on luxury watches. It’s even tougher when people have negative associations with your city, like the Detroit bankruptcy. Bridget Russo, Shinola’s chief marketing officer, wasn’t worried about my small, informal study in Sweden. She says they’ve used Detroit’s bankruptcy as a positive. And Russo thinks the Detroit comeback story will sell well in Europe too. Russo says they have another European strategy beyond selling gritty Detroit: letting the product speak for itself. Shinola is trading on some past marketing wins, too. The name used to belong to an American shoe polish company that began in Rochester, NY in the 19th century. The product became associated with the phrase, “You don’t know sh*t from Shinola.” (Translation: Shoe polish and dog deposits look similar, so if you can’t tell the difference, you must not be too bright.) The modern watch company bought the old Shinola name.